As technology innovates, more and more companies are creating smart speakers like Alexa, Google Home, and Apple’s Home Pod. With this comes the opportunity for homeowners to almost completely integrate accessories like lights, garage doors, alarms, and perhaps most notably, entertainment systems. 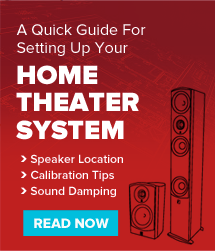 What's next for home theater and audio in general? From Dolby Atmos to virtual reality, it's an exciting time with technology progressing rapidly and moving into new areas. Here are our predictions of where we think tech is heading in the near future. When you dive into the world of TV tech there's a lot of jargon that gets thrown around and much of it can be confusing to folks that haven't bought a new set in a while. This article will help explain what all of those terms mean as well as getting into how some of the technology works. Passive vs. Active Speakers, Which is Right for You? There's a million ways to skin a speaker, tower vs. bookshelf, cabinet vs. in wall or in ceiling and another that comes up frequently, active vs. passive. We'll take a look at the differences between each design as well as the overall advantages and specific use cases that will benefit from one or the other. With summer in full swing it's time to take dip into the new release pool and see what we can find to fuel our BBQs and swim sessions with fresh new tunes. Luckily 2018 has remained a strong year for new music, here's our rundown of a couple recent albums that we recommend checking out. LED vs OLED vs QLED Displays, Which Should You Choose? Ever since flat screens reached the mass market in the late '90s and early '00s, there have been rival technologies. First it was plasma vs LCD, then LCD vs LED and now LED vs OLED vs QLED. Throughout each generation, consumers have had some tricky decisions to navigate. But we're here to help, this article will go over the differences between traditional LCD and LED displays as well as the newer OLED and QLED technologies.